Do you love to hang out in the backyard, sipping on some ice cold sweet tea, and enjoying the weather! I love that my backyard feels like an outdoor oasis, it can really relax me after a long day at work! If your backyard needs a little TLC, then you might enjoy this list of small backyard ideas to help dress up your yard! These small backyard ideas go farther than fixing up your landscaping, these ideas are ways to help add personality and style to your yard. Add a little fountain, furniture made from wooden pallets and more! If you love the sound of running water, but don’t have a lot of room, this is perfect! This is one of the small backyard ideas that you can have finished within a day! 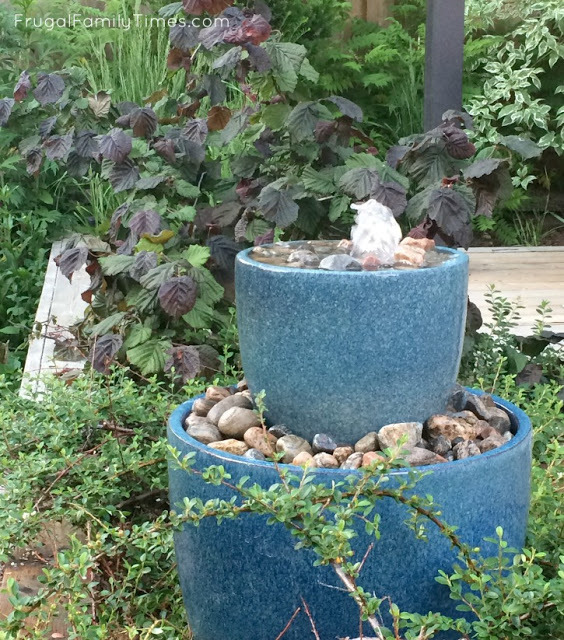 Create your own fountain [Frugal Family Times], to sit by and enjoy all summer long! Create some of these rustic and fun mason jar lanterns [Chez Beeper Bebe] to hang on your fence! This will add great lighting to your yard and give your yard a really calm and relaxing feel, and help dress it up! Add this DIY wall accent [Sugar & Cloth] to the side of your house or even lean up against your fence. Place some potted plants, and watch your yard come to life! I love having an herb garden, and this DIY herb garden pallet [Messy Art] is adorable and so clever! 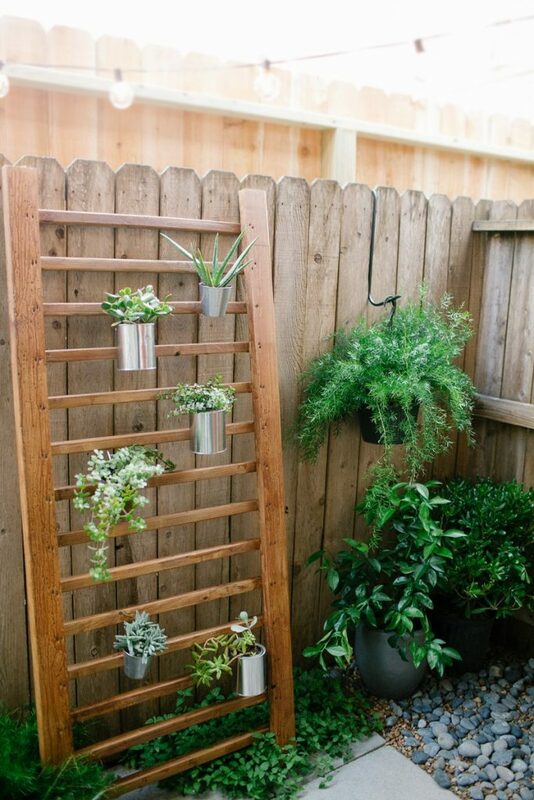 Create an herb garden that takes up minimal space! You can go out in your backyard and pick fresh herbs to go in your next dish! If you want to add some outdoor furniture to your yard, consider making your own out of wooden pallets [Place of My Taste]! 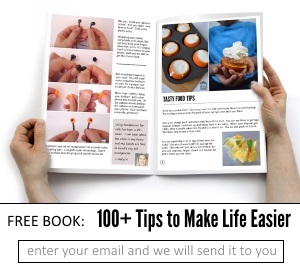 They look so neat, and it can be a one of a kind piece! 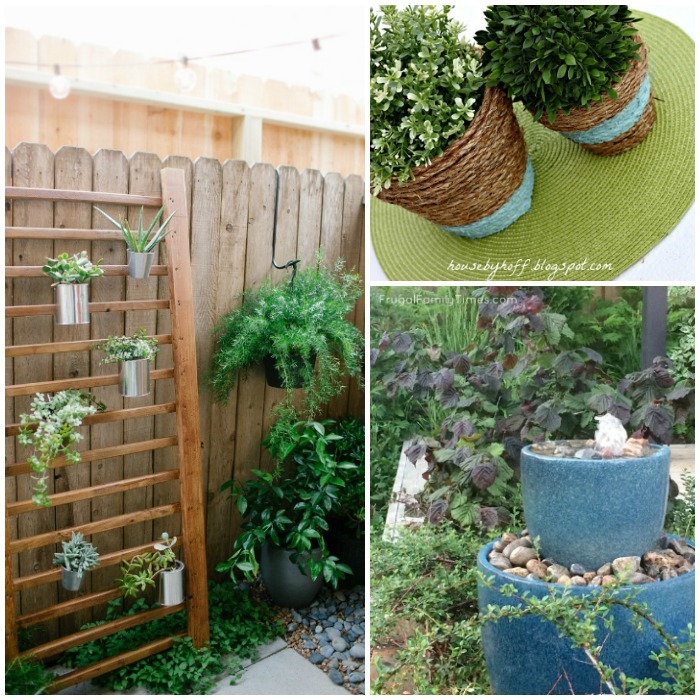 You might think dressing up a potted plant [House of Hoff] is a very simple idea, but you might be amazed at how much charm it adds to your backyard. It looks so neat, and a great way to make it custom to you! 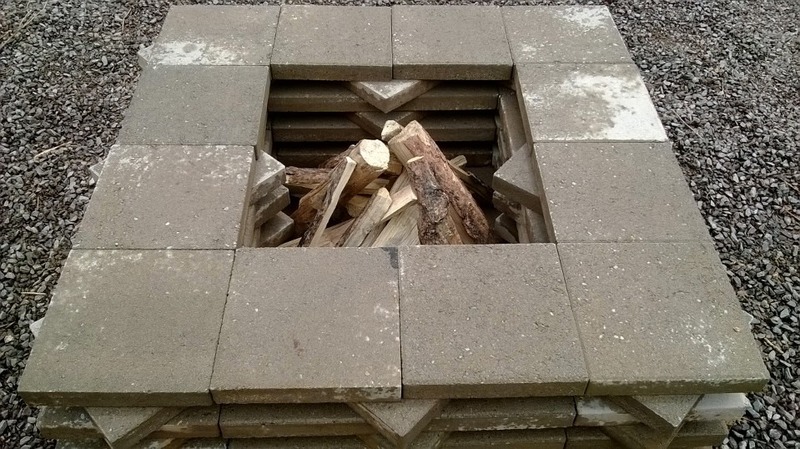 If you have some cinder blocks, put them to use. Create yourself a little bench! You can paint the wood to add some color, or leave plain, either way it is really awesome. Check out the cinder block bench tutorial from Fab Everyday! This DIY Arbor and Bench can really add a lot of character to your backyard! If you have a little area where you enjoy sitting, this would be perfect. 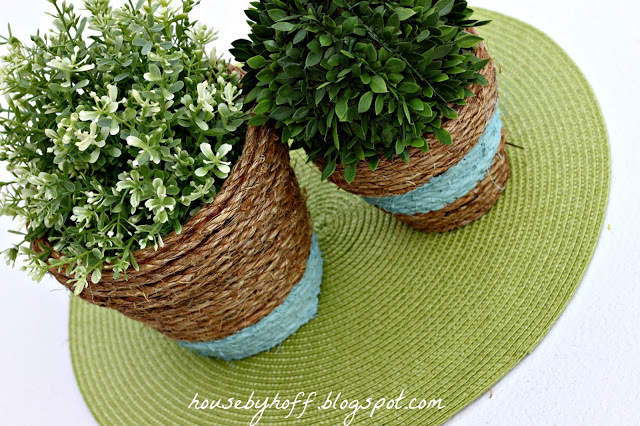 Plant some flowers or place potted plants on each side, to dress it up even more. I love having a sandbox in the yard, kids love to play in them! But, you want to make sure it is covered so critters don’t use it as a bathroom. This wooden sandbox has a lid, which makes it a perfect piece for your yard! Create a little walkway in your small backyard. Maybe from your garden to your door, or just a little spot in the corner. I love the look of the railroad tie paired with the rock [Apartement Therapy]! Consider building your own fire pit [Slap Dash Mom] for the fraction of the price as purchasing one! They don’t take much to make, and you could have it up and running in a day! I love, love, love this, you take old tires and wrap twine around them to make rustic style ottomans for seating or kicking your feet up! If you have old tires laying around, this is very affordable! Wow, this is such a clever idea, to add some pretty color from the flowers and light on a dark night from the DIY lamp posts! This wouldn’t take to much to make, but would add so much charm to your small backyard! This is an affordable way to have a hammock to lounge on and stare at the stars on summer nights! Check out this great DIY hammock stand from Here Comes the Sun! These small backyard ideas are clever and unique, and your friends and family will ask where you got everything from! 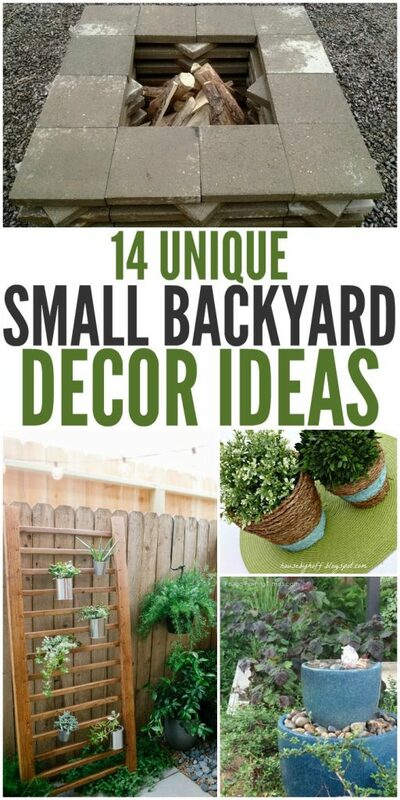 Check out more backyard ideas here, like outdoor games, ideas for kids, fairy gardens and more.